200 is a great number – more so, for the bowler – not many reach there – and today this man stood tall, reaching there to become the second fastest in the world and the fastest Indian to reach that landmark – Ravichandran Ashwin. The Countess of Wessex has completed her epic 445 mile bike ride from Edinburgh’s Palace of Holyroodhouse to Buckingham Palace for her father-in-law’s Duke of Edinburgh 60th anniversary challenge. Sophie said she was overwhelmed as she pedalled through the gates of Buckingham Palace to the huge crowds and the Coldstream Guards. The Countess and her team set out from the Palace of Holyroodhouse in Scotland on Monday for the ride in support of the Duke of Edinburgh's Award to celebrate the scheme's 60th anniversary. It was revealed that Prince Philip thought she was 'slightly mad' for partaking. Big feats, worthy of celebration – just as Indians are at the achievement of Ashwin. At Kanpur, in India’s historic 500th test, New Zealand will go into the final day of the first Test against India requiring a dogged batting effort to save the game.Needing 434 to win or to bat out four sessions in Kanpur for the draw, the Black Caps closed on 93 for four after Ravichandran Ashwin made early inroads. India resumed in the morning on 159 for one and made steady progress for much of the day, Murali Vijay and Cheteshwar Pujara taking their second-wicket stand to 133 before the former was trapped lbw by Mitchell Santner for 76. India was hailed as land of spinners – when the famous quartet Bishan Bedi, Chandrasekhar, Erapalli Prasanna and Venkatraghavan prospered – there were the likes of VV Kumar, Doshi, Shivalkar, Goel, Hans, Dhiraj Parsana, Ramnarayan, Shukla, Raghuram Bhat and more – who could not make the cut over the dominance of the quartet and Ranji matches were ‘bowler-dominated !’. Dilip Rasiklal Doshi, was one of only two Test bowlers who played in their first tests after the age of thirty, yet went on to take 100 wickets, the other being Clarrie Grimmett. Dilip Doshi, the slow leftarm spinner with spectacles, was born in Rajkot in 1947, debuted in 1979 when he was 32+, went on to play 33 Tests and 15 One dayers. There have been some quality off-spinners apart from Erapalli Prasanna and Srinivasan Venkatraghavan. Harbhajan was quite successful – remember his bowling during that Aussie tour in 2001, and that Kolkatta hat-trick.... there was Shivlal Yadav too (M Venkatramana, Ashish Kapoor, Ashok Patel, Arshad Ayub, Sarandeep Singh, Gopal Sharma) – all Off-spinners, who played for India at some point of time. Ravichandran Ashwin prospered so well at home, and gone longway proving his mettle ! Ashwin today took the first three wickets to fall, in the process becoming the second-fastest man to 200 wickets in Test history. His 37 matches to reach the landmark puts him just ahead of Dennis Lillee and Waqar Younis, behind only former Australia leg-spinner Clarrie Grimmett on 36. Opening the bowling, the off-spinner removed openers Martin Guptill and Tom Latham in the fourth over of the innings with only three runs on the board. Having been denied Ross Taylor, Ashwin trapped Kane Williamson on the back foot in the final session of the fourth day in Kanpur, becoming the second-fastest bowler to 200 Test wickets, behind only Australia's Clarrie Grimmett. But for two rain-affected Tests in the West Indies series, he was a good chance to beat Grimmett to the mark. Ashwin got there in his 37th Test while Grimmett took 36. In 46 Tests, Harbhajan Singh was the fastest Indian before Ashwin. 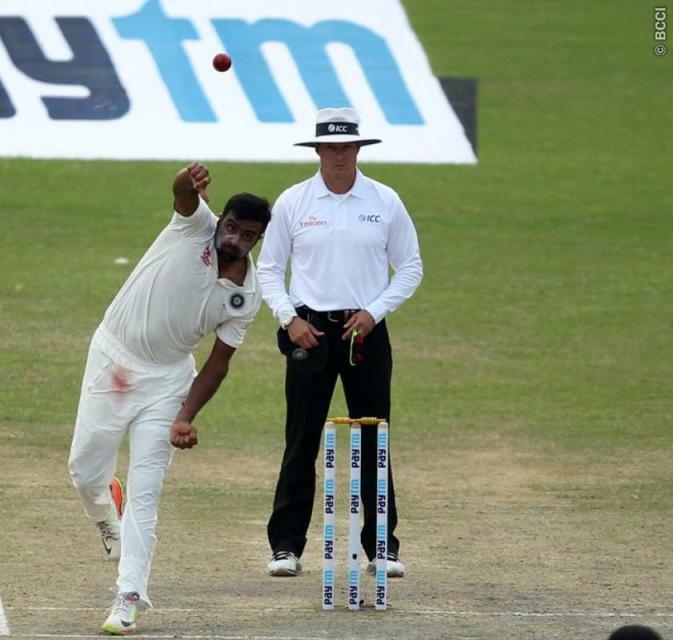 In getting there, Ashwin amassed 18 five-fors and four 10-wicket match hauls. He has more Man-of-the-Series awards than any other Indian. To go with that Ashwin has also scored four hundreds –making him a bowling all-rounder. The most famous Offie, Muttiah Muralitharan is the next quickest offspinner to 200 Test wickets, having taken 42 Tests. Harbhajan Singh had taken 46 matches to reach the milestone and Ash has beaten him by flat 9 tests. 51.40 Ashwin's strike rate - the best among 32 spinners to take 150 or more wickets in Tests. Among those with at least 100 wickets, only Johnny Briggs and Colin Blythe - who bowled on unprepared pitches around the turn of the 20th century - have struck more frequently. Glory to Ravi Ashwin – hope he bowls NZ out tomorrow beating them and earning another Man of the Match.